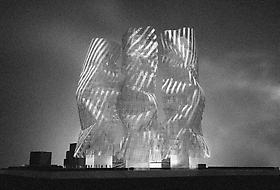 "Architect Frank Gehry needs no introduction, though you may not have met his models. Well, luckily, between now and June 29, you can meet these beauties at Leslie Feely Fine Art in New York City. "Frank Gehry: At Work” offers a unique opportunity to see this master builder’s craftsmanship and approach up close and personal. More after the jump! Models, though rarely seen by the public, hold a special place in the architectural profession. Freed from the constraints of full-scale construction, a designer can let his or her intentions be fulfilled to the nth degree in any conceivable material. Models also offer a rare opportunity to understand an architect’s design process—and they’re frequently beautiful objects to boot! Gehry’s architecture has always been equally photogenic and textural, and this exhibition lets viewers really experience the latter. ”Frank Gehry: At Work” includes more than 30 of the designer’s process models, spanning a large swathe of his career from 1985 to 2012. Translucent, shimmering, solid, and intricate, these objects are frequently displayed alongside images of the final built project. Comparing the finished building to its model may surprise you, however. As Gehry says in the exhibition brief, each model is just the starting point: 'It’s kind of like throwing things out and then following the ideas, rather than predicting what you’re going to do.'"